There's just something about Scrabble that makes it hugely fun to play online, whether that's via Facebook app or on your smartphone, sending the game into a surge of new-found popularity over the past several years. Sometimes, with the lack of an official option we turn to Scrabble-alikes (after all, you can't patent gameplay mechanics) to get our fix, like we had been doing on Android thanks to Words with Friends. Now even Android users have a chance to go legit, with Electronic Arts releasing the official Scrabble app to the Android Market. The free, ad-supported game is getting largely favorable reviews so far, peppered with the occasional report of compatibility problems. When it works, though, it works well, though users noted the ad placement as a little heavy-handed. One concern if you're running low on storage: what should be a very small, tightly-coded app is instead a 19 megabyte download. On the plus side, you get support for cross-platform gaming, letting you take on friends via their iPhones or over Facebook, and it includes chat tools and score diagnostics. 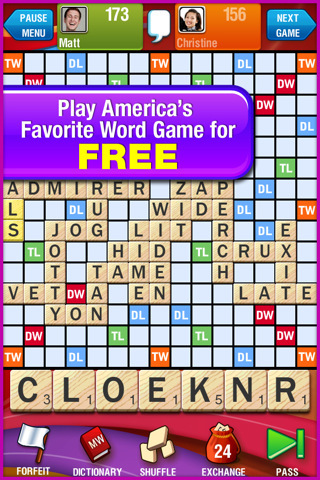 Scrabble for Android is available for download in the Android Market now.